Traffic wardens are back on patrol in Ceredigion after an absence of a year. The county's three former wardens were withdrawn on 31 May 2011 after control for them switched from the police to the county council. The six new civil enforcement officers (CEOs) have been handing out warning notices to illegally parked vehicles since 29 May, in the run up to Monday. 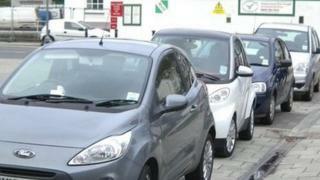 There have been complaints of parking chaos in Aberystwyth and Cardigan in the last year. Ceredigion council warned a year ago that it would take time to put its new CEO system in place. Its six parking officers will manage on-street parking and council-run car parks. Their introduction will be a relief to many in the county. In Aberystwyth, vehicles have parked illegally on double yellow lines, in loading bays, disabled parking bays and even on pavements, which have led to complaints about a parking "free-for-all". Business leaders have claimed that shops have suffered as a result, with some shoppers avoiding towns such as Aberystwyth because of the so-called chaos. Chairman of Aberystwyth Chamber of Commerce Chris Mackenzie-Grieve said: "Delivery drivers, disabled people and residents of the town were impacted the most. "Getting a space in town became a lottery with people parking cars for days at a time, in particular when the students were in situ. "The lack of vehicles moving on after allocated time periods, as happened under the traffic wardens, meant the congestion and availability was further exasperated. "Order will hopefully be restored in the next week." There have also been complaints about illegal parking in Cardigan. Town mayor Mark Cole said: "The return of traffic wardens in early June will bring back some much needed order to town. "Whilst we may not have suffered from the level of parking infringements that have been experienced in Aberystwyth, I have nevertheless received many calls over the past 12 months from local residents who have suffered from inconsiderate parking." The AA has also accused drivers in the county of being "very selfish and potentially dangerous". A Ceredigion council spokeswoman said: "A civil parking enforcement team has been appointed, which includes a supervisor and six full-time civil enforcement officers. "They will be responsible for enforcement duties throughout the county from June 4, and will be working seven days a week, including evenings and bank holidays." Aberystwyth mayor Dylan Lewis welcomed the introduction of the CEOs, and said he hoped people treated them with respect. "It's been quite chaotic around town for the last 12 months," he said. "Something had to be done to restore a bit of order, so this is welcome. "There's been some very irresponsible drivers who have shown a lack of consideration for other drivers and pedestrians." Two of the three former traffic wardens worked in Aberystwyth, while a third had responsibility for Cardigan and other areas in the south of the county. Ceredigion council had to submit an application to the Welsh government to create a parking enforcement area.